To improve our facility for our patients, Pitt Dental Medicine is rebuilding our main patient entrance. Please use the side entrance on Sutherland Dr. when you arrive to your dental appointment. 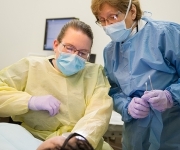 Pitt's School of Dental Medicine has been providing reduced cost general and specialty dental care to patients from the region since it was founded in 1896. More than 55,000 patients from southwestern Pennsylvania, and from as far away as Montana, Arizona and California, have been treated in the past 5 years. We are the region's dental medicine experts with a focus on providing you with the best care possible. The school’s Center for Patients with Special Needs provides dental care to adult and pediatric special needs patients. The Multidisciplinary Implant Center is a major collaboration among several departments at the School and a focal point and center of excellence for the region. A network of integrated dental and medical specialties supports patient care. Clinical outreach is provided through events held at the school, such as Give Kids a Smile Day, and through many established clinics across the Commonwealth. Emphasizing health promotion and disease prevention, doctor-supervised students serve patients' individual needs based on the best dental medicine. The School of Dental Medicine offers a limited dental evaluation for patients with urgent dental problems such as severe infections and recent dental trauma. CPSN provides a full range of services—from routine dental cleanings to oral surgery—for adults and children with disabilities and other health conditions who might otherwise complicate or rule out trips to the dentist. Good communication with our patients is crucial to getting excellent dental care. The School of Dental Medicine provides interpretation services for patients who aren't fluent in English or are hearing or communication impaired. If you require interpretation assistance, please contact the reception desk. 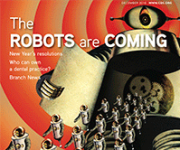 Pitt Dental Medicine's Dr. Suvendra Vijayan presents the digital future of dentistry in the December issue of the Chicago Dental Society's magazine . Brig. 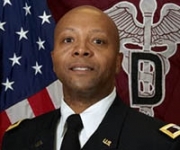 Gen. Shan Bagby (DMD ’93) discusses his life-long love of learning.